C. S. Friedman made a name for herself with the amazing Coldfire trilogy. Indeed, these books established the author as a master of dark fantasy during the 90s. Sadly, the Magisters trilogy, although awesome, flew so low under the radar that very few people seem to have read it. If more and more people actually gave these books a shot, we might soon refer to the Coldfire trilogy as the Friedman's other fantasy series. Yes, it's that damn good! And you can now get your hands on the digital edition of the first volume, Feast of Souls, for only 2.99$ here. This trilogy deserves the highest possible recommendation! At the end of her bestselling Coldfire trilogy, C.S. Friedman challenged readers to imagine what a world would be like if sorcery required the ultimate sacrifice-that of life itself. 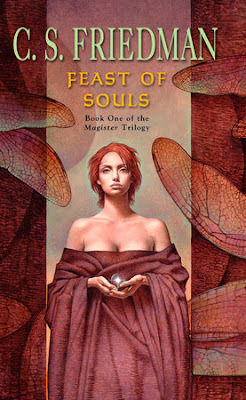 Now, in Feast of Souls, she introduces us to a terrifying world in which the cost of magic is just that...in which the fuel for sorcery is the very fire of the human spirit, and those who hunger for magical power must pay for it with their lives. In this epic tale of nightmarish shadows and desperate hope, the greatest threat of all may not be that of ancient enemies returned, or ancient wars resumed, but of the darkness that lies within the hearts of men. Here's a link to my review from 2007.